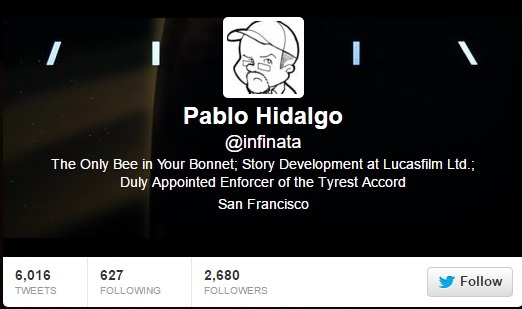 A year and a half ago this month marks a significant date for Star Wars fans. Why? 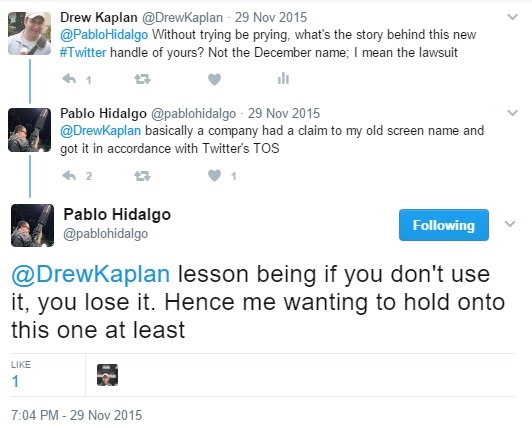 Because that is when Pablo Hidalgo made his triumphant return to Twitter. 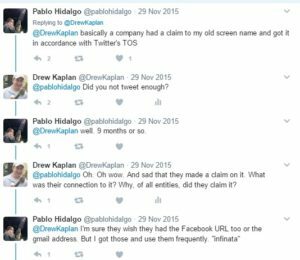 Hidalgo, of the Lucasfilm Story Group, is not only a very knowledgeable key figure at Lucasfilm, but also one who has become known as willing to answer fans’ questions. As Mike Cooper has described him, “Pablo almost certainly has the biggest profile among major (read: obsessive) Star Wars fans, due to his status as one of the company’s ‘continuity experts’ and his willingness to answer, or at least respond to, even the most inane and redundant questions.” However, it wasn’t always like this. It took losing his Twitter account to encourage him to engage with the social medium. 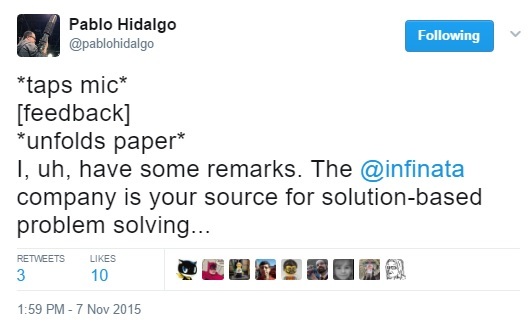 *taps mic* [feedback] *unfolds paper* I, uh, have some remarks. The @infinata company is your source for solution-based problem solving with global-based worldwide internationalism, they are the preeminent leaders in strategic planning with a history of tradition. And though they share a name with the evil ruler of Dimensia Five made famous in drug-addled Canadian cartoons of the 1960s, they have the legitimate claim to what was, at one time, a great Twitter handle, as stipulated in the terms of service of this platform. The affected parties have arrived at a solution both amicable and arbitrary. This account now returns to its prolonged slumber. Go #NHLJets. 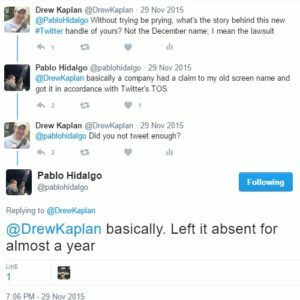 Of course, despite finishing off with “This account now returns to its prolonged slumber”, this renewed tweeting seemed to have propelled Hidalgo to have engaged more on Twitter. Not only was there a fair amount of tweeting that day, but also throughout November 2015. 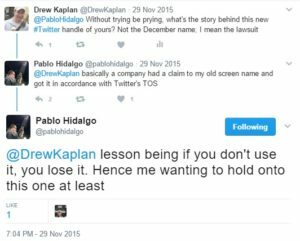 At first, there was a concern that this new @PabloHidalgo twitter handle could have been fake or an impersonation, however, it did, fortunately, turn out to be Pablo Hidalgo, himself. 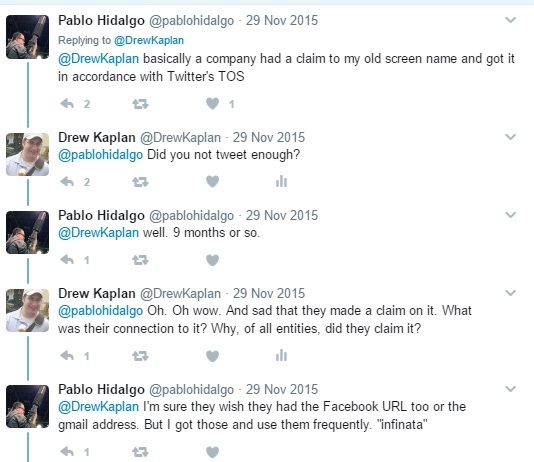 Later in the month, however, I was able to ask him further about it and, this time, he was more forthcoming about it, writing that “basically, a company had a claim to my old screen name and got it in accordance with Twitter’s TOS”, since, according to him, he hadn’t tweeted in “9 months or so (he also described it as having “left it absent for almost a year.”) For Star Wars fans who follow him on Twitter (and those who harass him), this can seem baffling that Hidalgo, who they know to now be quite active on the social medium, had not used his account in such a while. 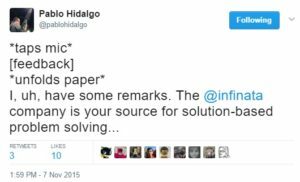 Fortunately for us Star Wars fans, Hidalgo not only kept up his Twitter use, but he actually got more involved using the social medium, allowing fans to more easily interact with him and to discover answers to their Star Wars questions.